We are very excited to celebrate our next feature baby - Nate! We first met Nate and his parents in Mini Movers class when he was four month old. He already loved tummy time, but was able to learn some other fun challenges when on his tummy and back. By the time we saw him the next month in class, he was starting to get his hands free for sitting! After three months of Mini Movers classes, Nate was ready to take on a Master Movers series! He started crawling, pulling up to stand, and cruising. By the end, he was taking a few independent steps and had his first birthday!! We really enjoyed getting to know Nate and his village. We had the pleasure of seeing him, his parents, and many other family members along the way! This little guy is thriving with all the love that surrounds him, and he loves to be the center of attention! We love Babies On The Move! We started going to classes when Nathaniel was about 4 months old and we loved it ever since (he just celebrated his first birthday). Nate was already a tummy time champion, but as first time parents, we wanted to encourage his motor development further (while keeping it fun). Mini and Master Movers classes were exactly what we were looking for. Every class we learned something new - how do some advance tummy time, how to practice sitting, correctly position our son for standing and what muscles our LO is strengthening (just to mention a few). We learned all the different little things our son needed to master before moving to the next milestone. We were amazed to suddenly notice all the small movements that he was so tirelessly practicing - without us even realizing it! Becca and Rachel always answered all of our questions and showed us what we can practice at home throughout the month. They always had some new fun excercise in mind, and it was always tailored specifically to Nate and his personality. Most important, Nate had a great time every class as both Becca and Rachel are incredibly engaging and affectionate! We cannot recommend these classes enough! They eased us into the parenting learning curve and truly gave us a new perspective on our son’s development. Thanks for having us and teaching us so much! 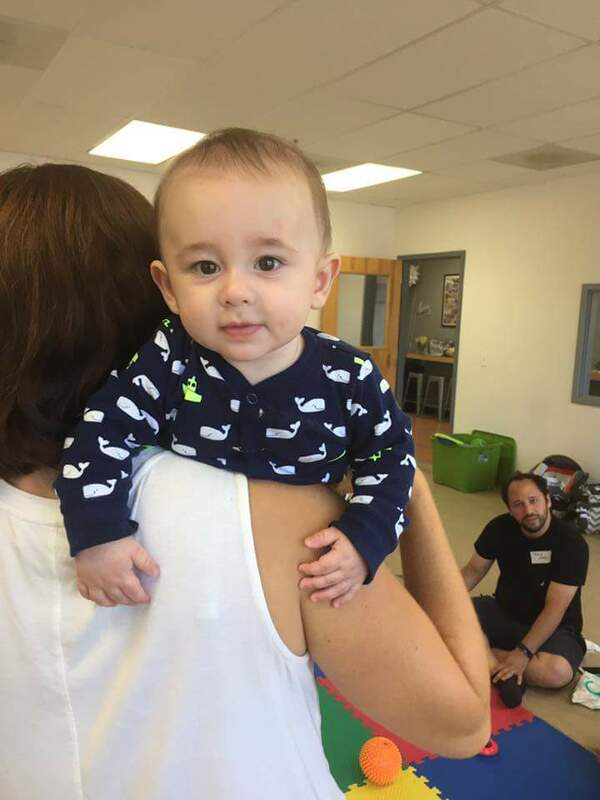 The Motor Development: Basics and Beyond Series of classes is returning to Baby + Co in Cary, NC for January - February 2018! Whether your infant needs help learning to enjoy tummy time or find his way to hands and knees for crawling, these skill specific classes offer a variety of ways to help your baby master motor development. Each class reviews typical infant development and provides hands on teaching with opportunities for parent practice. The casual and comfortable environment encourages parent and child interaction while learning from expert pediatric physical therapists in a social setting. The Motor Development: Basics and Beyond Series of classes is returning to Baby + Co in Cary, NC for September - November 2017! Whether your infant needs help learning to enjoy tummy time or find his way to hands and knees for crawling, these skill specific classes offer a variety of ways to help your baby master motor development. We are very excited to announce the next feature baby, Dottie! Dottie and her mom Sarah started coming to Babies On The MOVE Mini Movers classes in July 2016, when she was three months old. Sarah works really close to Open Arts Studio in Morrisville where our monthly classes are held and is able to bring Dottie to work with her, so our classes were super-convenient for them to come almost every month! Here are some early tummy time pics that show how determined this little one was to move from early on! They switched over to Master Movers classes in November when Dottie was turning 7 months old, could sit well by herself, and was ready for a new challenge! While attending Master Movers classes, Dottie learned how to move out of sitting by going over each side, get on to hands and knees, creep, pull up to stand, squat to pick up toys, and walk holding on to furniture! In March 2017, at 11 months old, she came to class and showed off her cool new trick --- Taking steps all by herself!!! We are excited for their family on this next chapter in their lives and thank them for sharing the first year with us! We look forward to having them stop by the studio every so often to see what she's up to along the way! This month we are featuring our adorable little friend Sydney! We first met Sydney in September when she was almost four months old. At that point, she was comfortable doing some tummy time, but we showed her parents Danielle and Matt ways to make it a little easier by getting her weight back off her chest a bit. We also showed them how to help her roll over and support her in sitting with good alignment. After their first Babies On The MOVE class, they signed up for a three-month series of classes. At her next class, we could see how much stronger Sydney was getting! She was doing really well on her tummy, propping on her arms and lifting them up off the floor. Not only could she lift her head really well on her tummy, but she was also lifting it really well when she was lying on her sides and when she was lying on her back! Her parents held her in sitting with great alignment, just as they had learned in class. At the class the following month, she was able to sit without them holding on to her, just being there for when she lost her balance! We taught her parents things to encourage when she was on her tummy to help her work towards crawling. In the last class of their three class series, Sydney was starting to move onto her tummy from sitting all by herself! She had good balance when her parents held her supported in standing, using techniques we taught them to keep her from going up on her toes. Sydney was also starting to move towards getting on her hands and knees by moving over the sides is sitting. By the time we saw Sydney next, she was crawling all over and pulling up to standing on furniture! We gave her parents ideas of things to help her be more stable on her feet and get her on her way to walking. We can't believe this sweet little girl is going to be walking all over the place in the next few months! It's time to showcase another one of our adorable babies! This time, we want to highlight the journey of Jane Marie. Jane was born at 34 weeks growth restricted. She was a tiny 4 pounds and stayed in the NICU for 3 weeks until she was able to go home. Her parents, Kenneth and Deanna, were prepared for her to develop at a slower rate than her peers and were told that there was a possibility that she would need Physical Therapy. They were proactive and signed up for our MINI MOVERS series of classes then continued on with MASTER MOVERS classes as she grew. At the first class, she did a great job with tummy time, but her parents were concerned that she was not able to roll from her tummy to her back yet. One month later, she was lifting her head to help with rolling and sitting well with support, but her parents were concerned that she was still not rolling and she was not sitting up by herself. Despite their concerns, they knew that Jane's determined spirit would help her get where she needed to be developmentally. Then, Jane had an explosion of growth and development where she learned how to roll over, sit by herself, and crawl! We were very impressed with how great Jane's motor skills looked! She was no longer moving along her own curve, she was a true MASTER MOVER! Jane was able to avoid needing Physical Therapy and is a thriving, active little MOVER! "Becca and Rachel were so helpful in helping me feel secure in Jane's development and they assured me that I was doing the right things. I asked questions about how to encourage her to roll. I was taught how to help her sit up from a side position. Becca and Rachel assured me that we didn't need to purchase expensive equipment or toys, but that Jane was on her own time table. Babies On The MOVE helps us to know what to expect developmentally and gives Jane time to interact with others who are near her age." "As a first-time father, I wanted to be informed and feel comfortable about my own parenting. I knew that Jane would develop fairly well, and the pediatrician was confident about Jane's growth also. Attending some of the MINI MOVER classes was a great way to become more informed, dispel myths, and socialize with Jane and other parents. Rachel and Becca were welcoming of having a father in the group, and never created confusion or left unanswered questions. I'm also very pleased that having the added consult helped Deanna and I sort through motor development without feeling overwhelmed or guilty. Jane has made appropriate progress, and seems very happy when she succeeds at practicing movement. I feel it was an overall great socialization for the family and good information to develop our parenting." Thank you Deanna and Kenneth for sharing your experiences. We have a passion for helping parents confidently guide their children on the path of early movement success! We have enjoyed watching Jane blossom into the active little girl that she is and can't wait to see her taking her first steps!! We have had a busy month at Babies On The MOVE! The studio that we have been hosting classes at - Open Arts - underwent major renovation and now has two wonderful large studios that we can use to host classes. In MINI MOVERS class, we learned a trick to enjoying tummy time from one of our little friends - just sleep through it! Disclaimer: tummy time is not a recommended sleeping position, but his awesome mom doesn't mind if he takes a little nap on his tummy as long as she is there to keep an eye on him. MINI MOVERS also learned ideas to try if your baby doesn't want to put weight on their arms when they are on their tummy or if they don't want to put weight on their legs in standing. MASTER MOVERS was a big party with lots of fun babies and parents. The babies were all working on something different developmentally, but still had fun playing together! We can't wait to see what everyone is up to next month! "I was so excited to see in my local moms group that two physical therapists were offering a ‘Babies on the Move’ class. As a first time mom I had tons of questions about my babies mobility and fears that he wouldn’t hit milestones in development. Like most babies, my son hated tummy time. After going to the first class, I learned that there are different ways to incorporate tummy time besides the traditional laying your baby on a play mat and listening to them cry. I learned how important it is for a baby to build a strong core. I returned to the next class and my son was already starting to roll over. Rachel and Rebecca taught me how to help my son roll if he got stuck half way through. The next class my son was already starting to sit up so I learned how to place some of the larger toys I had that made noise on the floor so I could sit him in front of them and he could lean in and reach for things. I really think that this class changed things for my baby. He loved sitting and playing with his activity center and 2-3 weeks after this class he was literally on the move…he started to crawl. I feel like the 4 classes I attended put him ahead of the curve, at 9 months and 6 days he is standing and walking with very little assistance. I am so appreciative for everything I learned and highly recommend these classes." 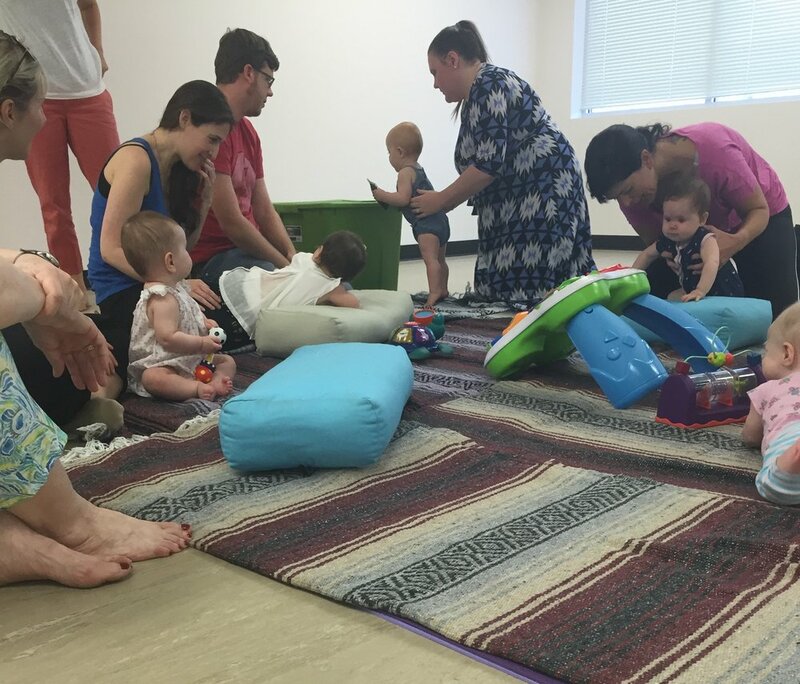 Summer is in full swing and so are our Babies On The MOVE baby movement classes in Morrisville, North Carolina! Families are escaping the heat to get inside and learn about ways to play with their babies to help them build strength and progress to the next motor milestone. 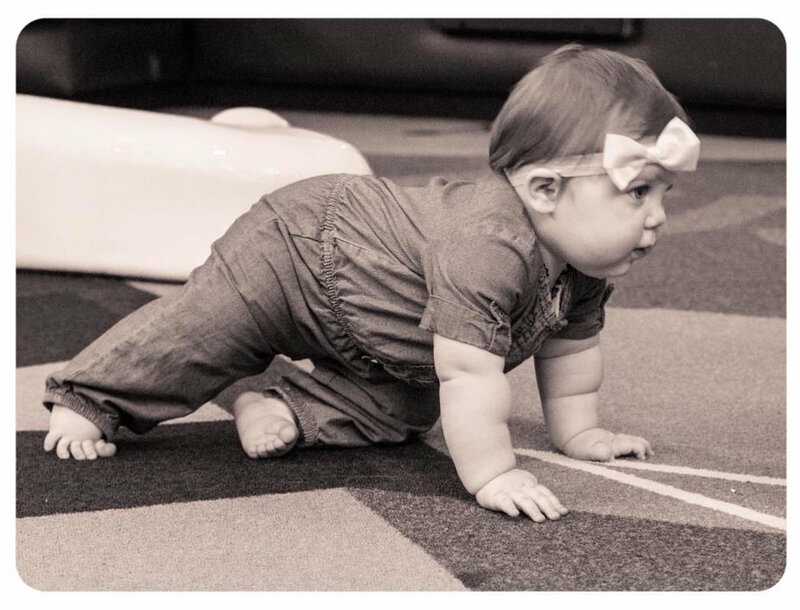 We love to do tummy time and teach parents ways to make it fun for everyone, but that's not the only thing you can do to help your little one build their muscles! All of the developmental positions are important for building your baby's foundation for future movement - lying on their back, lying on their tummy, lying on their side, sitting, and standing. Playing with your baby in all of these positions with the correct alignment will help them gain strength and master new skills. We had a great weekend of classes at Babies On The MOVE! The groups were smaller than usual this month, so all the babies got lots of personalized attention. Once again we were reminded of the wide variation that exists in normal baby development. It is so fun to see babies that are the same age choosing to move in different ways based on their personalities, exposures, and interests! Our classes this weekend also reminded me of the differences in the way a dad interacts with baby as compared to mom. Mom tends to be the safe spot, the home base. Dad helps show baby the world outside of mom. I love seeing dads interacting with their baby in a more adventurous way - upside down baby, airplane baby, and football carry are all great ways for dad to play with baby! Looking forward to seeing new friends and old at our classes in July! Babies On The MOVE classes will be offered at Grow, The Family Boutique in Raleigh, NC this Saturday, May 21st. 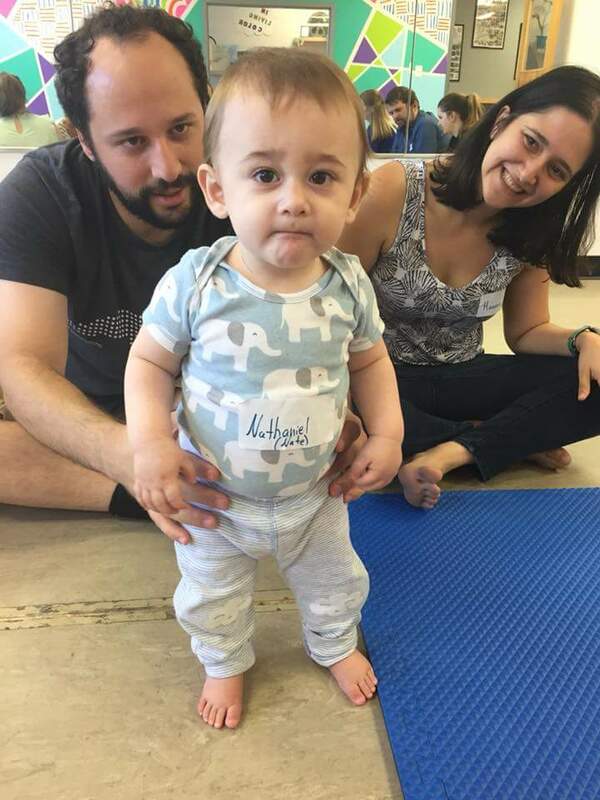 Join us for a MINI MOVERS class for babies age 0-6 months at 10:30 AM or a MASTER MOVERS class for babies from age 7 months up until they start taking their first steps at 11:30 AM. Babies begin building strength from the day that they are born. Parents can help their babies master new skills and learn to enjoy movement from an early age. These classes will teach you how to position, carry, and play with your baby to encourage them to move and progress to the next milestone. The casual and comfortable environment encourages parent and child interaction while learning from expert physical therapists in a social setting. Classes are customized to the needs of the parents and the developmental stage of the infants attending. Grow is located at 2885 Jones Franklin Road in Raleigh, NC. Contact Grow directly at 919-803-3521 to register for these events. Thanks to all who came out for the MASTER MOVERS baby classes this weekend on Friday and Sunday in Morrisville, NC. We had a great time seeing old friends and meeting new ones! This class really highlights for me the wide range of typical development that happens from 7 months until babies start taking their first steps. It is truly amazing to see how much and how fast babies change! We offer the Babies On The MOVE classes monthly for this reason. The babies in the MASTER MOVERS classes this weekend were a prime example of the range of typical development. In one class, we had an almost 7 month old moving and grooving in tummy time while an 11 month old was taking some independent steps - oh how things can change in four short months!